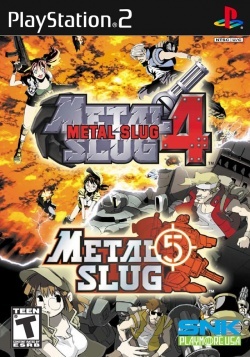 Game description: Now you can play two of your arcade favorites without any quarters, since Metal Slug 4 and 5 have come to the PlayStation 2 in one complete package. Join Marco and a cast of other Metal Slug characters as they battle corrupt forces in the air, on the sea, and on land. Use power-ups, special weapons, health, and ammo to try to keep up with each game's nonstop action and challenging enemies. Of course, you can also test-drive the next generation of Metal Slug vehicles. These collections include American and Korean editions of Metal Slug 4 and Metal Slug 5. Although these games were not released separately in the US or Korea each disc has a corresponding serial number: SLKA-25287 and SLKA-25288 for the Korean release and SLUS-20971 and SLUS-20990 for the US release. Please put the test info on the corresponding games' pages. This page was last edited on 29 January 2018, at 19:39.